This is the ultimate comfort food after a long and hectic day at work. Like everyone else, there are more days than I would like to admit where I was too tired to be bothered to cook. And on these days, I fall back to recipes that are simple, comforting and reminds me of home. This braised minced pork with Chinese five spice powder is easy and so delicious served on rice or even on noodles. How easy can this recipe be? Because the pork is all minced up, it doesn’t take too long to braise this dish at all. Go for a shower and by the time you’re ready, dinner is ready too – you just need to remember to also cook the rice before you hop into the shower. If you don’t like pork, this recipe also works well with minced chicken. Or turkey. You can even jazz it up with some vegetables too; preferred vegetables for this dish includes shitake mushrooms, carrots, green beans and potatoes, cut into the smallest pieces you can muster. Heat pan with oil and sesame oil under medium heat. And when the oils are hot, add the ginger and garlic in and saute for about 1 minute or until the garlic bits look slightly whitish. 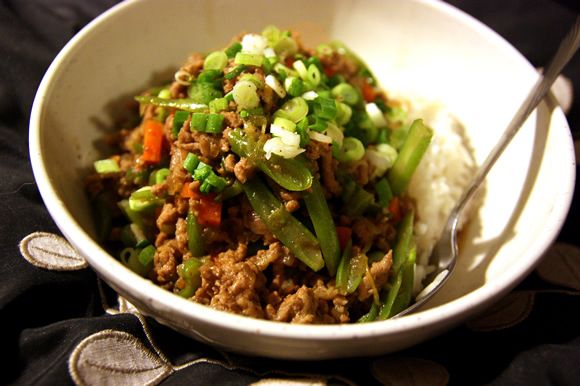 Add the minced pork in together with the vegetables and cook until the mince meat changes color from red to gray. At this point, add the rest of the seasonings in and water. Stir and cook until the meat sauce comes to a simmer. Lower heat and let the meat sauce simmer with the lid on for about 20-30 minutes (or however long it takes for you to take that shower). Serve on white rice or on any kinds of noodles/pasta. This is such a go to dish for me now. Making it right now actually. Really lovely, made it fresh a couple of weeks and froze a portion. Had that tonight, even better . Highly recommended!